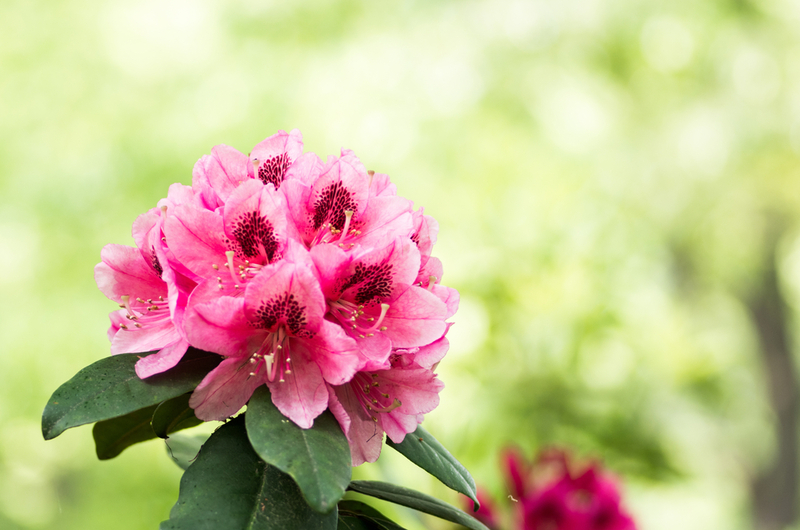 Think of the stunning rhododendron blooms and your thoughts are two-fold: mountains and the month of June. North Carolinians often make a special pilgrimage to catch this most popular of the spring blooms, be it to Craggy Gardens on the Blue Ridge Parkway, Roan Mountain above Carvers Gap or hundreds of other locations. The white corsage of the rosebay and Carolina rhododendrons, or the purple flower of the more popular Catawba rhododendron are well worth a dedicated weekend. Sometimes, though, by the time June rolls around your vacation thoughts turn to the beach; a trip to the mountains can be hard to squeeze in. Good to know you have a bloomin’ alternative. Certain habitats in the Piedmont harbor the perfect conditions for this cool-weather plant: steep, north-facing slopes where the summer sun isn’t as intense. We’ve identified five such places where you can catch an early bloom, which is just getting underway. It’s hard to picture a better habitat for cool-weather plants than Raven Rock, where a north-facing bluff rises 150 feet above the Cape Fear River. For a quick-fix, hike the 1.5-mile Little Creek Loop Trail, which is awash in evergreens, and piggyback it with the 2.6-mile Raven Rock Loop Trail, which deposits you at the base of Raven Rock. Escape the crowds and take the 5-mile Campbell Creek Loop Trail; hiked clockwise, your return along Campbell Creek is akin to walking a mountain stream, complete with rhodos and their little brother, the mountain laurel. Think of a classic rhododendron hike in the high country and you inevitably picture waterfalls in the mix. The first half mile of the 3.6-mile Indian Creek Trail couldn’t get more classic as it penetrates a dense tunnel of rhododendron on its vertiginous descent along its namesake creek. Upper and Lower Falls make great spots to take a rest and enjoy these two classic Southern Appalachian phenomena intertwined. Up for adding a workout into your sightseeing tour? Continue down Indian Creek to the Dan River, for a roundtrip excursion of 7.2 miles. When famed N.C. State naturalist B.W. Wells visited this geographic anomaly on the Johnston/Nash County line in the 1930s, he declared it a “freak of nature.” Catawba rhododendron, galax and other flora more common to the mountains? Freakish indeed. And certainly worth preserving, which is what the Triangle Land Conservancy thought when it purchased the first 10 acres (it now has 25) of the property. Today, a short trail takes you from Flower Hill Road down to Moccasin Creek, where a Mother’s Day viewing of the blooms has become tradition. The last panther in the Piedmont was reportedly spotted along the Eno River at the base of 867-foot Occoneechee Mountain around 1910. But that’s not the coolest part of this 190-acre natural area. Rather, it’s the couple-hundred yard stretch of the 2.2-mile Occoneechee Mountain Loop Trail beneath a 30-foot cliff along the Eno. There, in an area that rarely receives direct sunshine, you’ll find a bevy of montane flora: Bradley’s spleenwort, purple fringeless orchid, wild sarsaparilla, mountain laurel, galax and, of course, Catawba rhododendron. All just a stone’s throw from I-85. When you climb to the highest points of Crowders Mountain State Park — The Pinnacle and Crowders Mountain itself — you get not only the satisfaction of bagging a summit and great views, you get a chance to glimpse Catawba rhododendron on the respective mountains’ north-facing slopes. Two other rarities exist up top: the Virginia pine, which generally reaches no more than 6 feet in height, and the occasional American chestnut, all but wiped out by a blight introduced in 1905.